TOTO India Industries PVT. 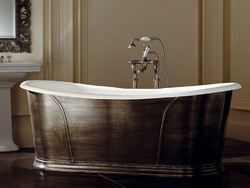 LTD.
A bath (pronounced /ˈbɑːθ/ or /ˈbθ/), bathtub (AmE), or tub (informal) is a plumbing fixture used for bathing. Most modern bathtubs are made of acrylic or fiberglass, but alternatives are available in enamel over steel or cast iron, and occasionally waterproof finished wood. A bathtub is usually placed in a bathroom either as a stand-alone fixture or in conjunction with a shower.